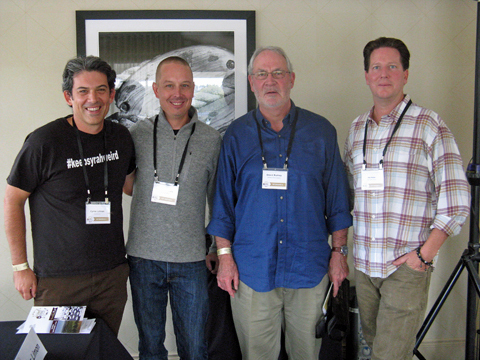 Report on the 2nd annual Petaluma Gap Wind to Wine Festival, held on Sunday November 6th, 2016 at The Sheraton Sonoma County in Petaluma, California. The focus of the event is on wines from the Petaluma Gap winegrape-growing region. This year’s Wind to Wine Festival started with two concurrent Sunday morning seminars, which were followed by the Grand Tasting in the afternoon. I attended a seminar and the Grand Tasting, and the tasting impressions below include wines from both of those portions of the event. The Wind to Wine Festival is hosted by the Petaluma Gap Winegrowers Alliance (PGWA). Founded in 2005, this is an organization of wineries, growers, and other associate members. The PGWA seeks to promote the growers and vintners who work with the region’s winegrapes, and to increase public awareness of the area’s history and current practices in grapegrowing and winemaking. Located in the southern portion of the large Sonoma Coast AVA and extending into the northern part of Marin County, the region’s name refers to the 15-mile wide gap in the coastal mountains that draws cool air from the Pacific Ocean and funnels it toward San Pablo Bay. The resulting wind that this creates is considered one of the Petaluma Gap’s defining climatic characteristics, as is the morning and late-afternoon fog that often blankets much of the area, helping to make it one of the coolest winegrape-growing regions in California. Growers and vintners in the area speak of the wind’s effect on the grapes themselves – smaller berries with thicker skins than are found in many other areas. The area’s first commercial winery was established in 1884. There were grapevines planted there earlier, though no pre-1900 vines still exist in the region. The Petaluma Gap is currently home to over 4,000 acres of vineyards, with Pinot Noir, Chardonnay, and Syrah being the most widely-planted grape varieties. The PGWA submitted a petition to the TTB in early 2015 to establish the Petaluma Gap as an AVA, most of which would be within the larger Sonoma Coast AVA. The review process is still ongoing, and there is a possibility that the Petaluma Gap AVA may be approved in 2017. 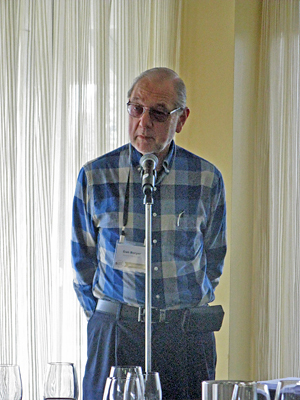 Rickey Trombetta of Trombetta Family Wines is the current president of the PGWA. I attended a Sunday morning seminar in addition to the Grand Tasting that immediately followed it. Those who opted to attend a seminar had a choice of two, which ran concurrently: “Cool-Climate Syrah” and “Food-Friendly Wines.” I chose the first of the two, though the other one sounded interesting as well – that one was moderated by noted sommelier and wine writer Chris Sawyer, with winemakers Ana Keller of Keller Estate, Erica Stancliff of Trombetta Family Wines, plus owner/chef Peter White of Sugo Trattoria, with food provided by Chef Richard Visconte. The Cool-Climate Syrah seminar that I attended featured winemakers Duncan Meyers of Arnot-Roberts, Pax Mahle of Pax Mahle Wines, David Ramey of Ramey Wine Cellars, and wine writer Cyrus Limón – whose “sólosyrah” blog is focused on cool-climate Syrah – with noted wine writer and competition judge Dan Berger moderating the panel. Dan started off the seminar by talking a little about one of the aromatic signatures of many Syrahs from cool-climate vineyards – black pepper. It’s been found that this derives from a compound called rotundone, which appears to be present in higher concentrations in vineyards planted in cooler climates, such as that of the Petaluma Gap. But as several of the seminar panelists pointed out, not all cool-climate Syrahs display this character – and in fact I found it difficult to find any particularly peppery aromas in many of the wines we tasted at the seminar. Before he turned things over to the panelists, Dan mentioned that it can be financially risky to grow Syrah in a cool climate – while the potential is there to make great wines in some years, it can be tough to sufficiently ripen a decent crop in other vintages. We tasted six Syrahs at the seminar – one current release from the three winemakers on the panel, two more current Petaluma Gap Syrahs from other vintners, plus one older New Zealand Syrah that Dan generously brought for the occasion. Notes on the wines are included in the Tasting Impressions portion of this report. Pax, Duncan, and David all spoke briefly about their wines and the vineyard sources. One of the other wines was from Waxwing Wine Cellars, and since winemaker Scott Sisemore was in attendance, he also spoke briefly. We started off with the 2013 “Rôtie” Syrah from Keller Estate, located just east of the Petaluma River, in the southeast portion of the proposed Petaluma Gap AVA. The wine was co-fermented with a small percentage of Viognier that’s also planted at the estate vineyard – it’s worth noting that it displayed a noticeably lighter color than any of the other Petaluma Gap Syrahs. Pax presented his Pax Mahle 2013 Griffin’s Lair Vineyard Syrah, and he noted that he began working with fruit from the vineyard in 2002 – located on a slope to the east of the Petaluma River, the vines are planted in coarse sand and gravel. He told us that a key goal in his winemaking regimen for this Syrah has been to limit the extraction and tannin from the small berries, by keeping maceration time short and using gentler pumpovers rather than punchdowns. Pax uses whole-cluster fermentation for the wine and ages it for about 10-11 months in neutral oak. Scott spoke about his Waxwing 2013 Flocchini Vineyard Syrah, sourced from a site directly adjacent to Griffin’s Lair. He noted that this vineyard also produces particularly small berries and that the wine from there has a different character from Syrahs he makes from other regions – he said it often has a roasted coffee or chocolate element when the fruit is picked at lower brix. Scott ferments with about 50% whole clusters and also likes shorter macerations to control extraction. David’s Syrah was the Ramey 2013 Rodgers Creek Vineyard bottling, co-fermented with about 10% Viognier. The vineyard was planted in 2002 and is on the southwest slope of Sonoma Mountain, near the eastern edge of the proposed Petaluma Gap AVA. He told us that he finds working with Syrah to be more similar to working with Pinot Noir than with Cabernet Sauvignon (he produces both those varieties as well) – both Dan and Duncan agreed that this more gentle approach is the way to go. The wine was fermented with about 25% whole clusters, and stayed in barrel for about two years before any racking. Next up was Duncan’s Arnot-Roberts 2014 Clary Ranch Syrah, from one of the westernmost vineyards in the Petaluma Gap region. He told us that it’s only about six miles from Tomales Bay near the ocean, in a particularly cold, foggy, and fairly isolated site. The 2006 bottling was Arnot-Robert’s first from this vineyard. As with Pax and Scott, Duncan said that he’s been backing off the extraction for the wine as he’s gained experience with fruit from the vineyard. The wine is entirely whole-cluster fermented, pressed after 10-14 days into neutral oak, and not racked until it’s ready for bottling after about 11 months. The wine that Dan brought was a 2006 Babich Syrah, from Hawkes Bay on New Zealand’s North Island – another cool-climate growing region. Of the six Syrahs we tasted at the seminar, the Pax Mahle Griffin’s Lair Vineyard was my favorite, with the Arnot-Roberts Clary Ranch and Waxwing Flocchini Vineyard not far behind. A question was posed about what makes Syrah from the Petaluma Gap distinctive in relation to the wines from other cooler-climate growing regions. Cyrus said that he feels that Petaluma Gap wines show a savory character that’s common to most cool-climate Syrah but they also tend to display a richness and depth that might be found more often in warmer areas. He noted that the ones from Clary Ranch are leaner – more “pure cool-climate” as he put it. And since the event is called “Wind to Wine,” what does the region’s noted wind contribute to Syrahs from there? A few viewpoints were discussed briefly, and Duncan said he’s found that windier sites such as Griffin’s Lair develop fruit with thicker skins (and therefore more potential tannin) than at less windy sites such as Clary Ranch. In fact, he pointed out that the vineyards in the western and eastern parts of Petaluma Gap can produce fruit that’s often quite different from one another. Perhaps both will become future AVAs on their own! Since I’d had a date conflict that prevented me from attending the inaugural Wind to Wine Festival in 2015, I was glad to be able to make it this year. 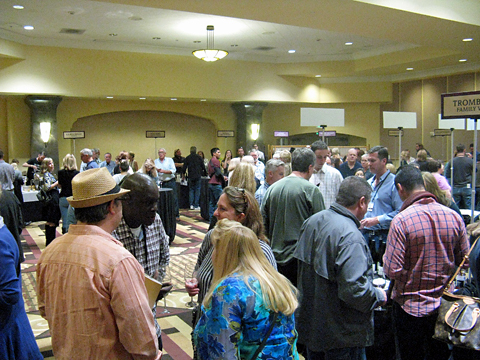 The PGWA currently includes over 30 member wineries, and nearly all of them poured their wines at the Grand Tasting. As is the case with many other region-based organizations such as PGWA, not all of the wineries themselves are located within the Petaluma Gap but still source fruit from there. This was my first opportunity to taste so many Petaluma Gap wines at a single event, and in the end, I felt I had a better grasp of what the region has to offer, and found some distinctions between these wines and those from other parts of the Sonoma Coast. The Sheraton venue worked very well – easy access from the freeway, plenty of parking, and the Grand Ballroom was a good-sized space to accommodate all the winery tables and the tasters without feeling overly crowded. Several tables throughout the room featured local food purveyors, who offered tempting small bites to complement the wines. The winery tables were arranged alphabetically, and combined with very good signage, this made it easy to find specific producers. Overall, the entire event was very well-organized and ran smoothly from beginning to end, thanks to the organizers and many volunteers on hand. I had enough time to make it to nearly all of the winery tables, missing only a couple of them. As you would expect from the Petaluma Gap region, the tasting was heavy on Chardonnay and Pinot Noir, though Syrah certainly was notable as well. Other varietal wines represented included Viognier, Pinot Meunier, and surprisingly, Tempranillo, while one field blend included Sauvignon Blanc and Muscat and another featured Grenache, Alicante Bouschet, Montepulciano, and Refosco among other varieties. I was able to try out quite a few producers that were new to me, and found some that poured some very fine wines. 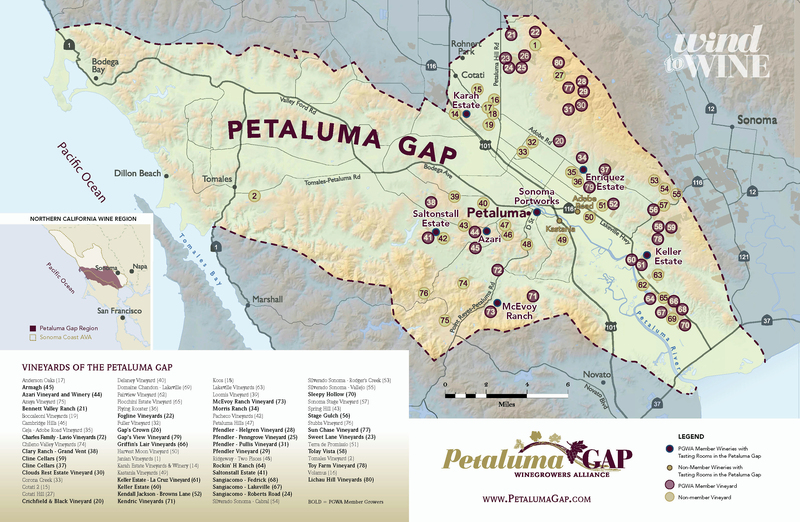 Most of the Petaluma Gap’s vineyards are located in a band that’s bounded roughly by the 101 freeway and the Petaluma River on the west and Sonoma Mountain to the east, running between Cotati and Rohnert Park on the north and almost to Highway 37 near San Pablo Bay in the south. A smaller group of vineyards is located west and southwest of Petaluma, and includes the handful of sites in northern Marin County. Vineyard sources from all of these portions of the Petaluma Gap were represented at the Grand Tasting. A tasting such as this allows comparison of wines sourced from the same vineyards (Gap’s Crown, Sangiacomo, Sun Chase, etc.) but made by different vintners, while other producers highlighted their own estate vineyards. 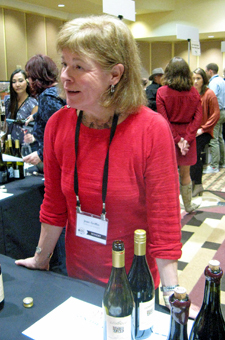 There was a separate table set up at the Grand Tasting for three Syrahs sourced from Griffin’s Lair Vineyard (Bedrock, Loxton, and Pax Mahle), all poured by vineyard owner Joan Griffin. Most of the wines that I tasted were from the 2013 and 2014 vintages, though wines from 2012 and 2015 were well-represented, and there were a handful of older vintages too. Overall, I felt the 2013 and 2014 wines showed particularly well. While the wines in my list of Favorites are naturally dominated by Chardonnay and Pinot Noir, I should mention that the Syrahs on the list were outstanding, some of the best wines of the day. The “Others of Note” list is for wines that I thought were just a notch below those in the other categories, but still among the tasting’s highlights. I felt the strongest overall wine line-ups of the event were those from Arnot-Roberts and Fogline, while Agnitió, Black Kite, Guarachi, Trombetta, and Waxwing also presented very good groups of wines. The lone wine from Pax Mahle was a standout as well. Tasting all of these Petaluma Gap wines at this event did give me a better feel for their character in relation to the wines from nearby areas. Overall, I felt that these wines were distinct from those of their western Sonoma County neighbors. Most were not as forward and lush as you’d find with many Russian River Valley wines, though I found them to be generally bolder and more structured than those from the western Sonoma Coast while still displaying a similar fine, elegant acidity. The Wind to Wine Festival was a very enjoyable event with plenty of standout wines, and it did a good job of showcasing the Petaluma Gap region. An AVA for the area seems overdue, and it should be a welcome addition to Sonoma County’s range of appellations. This tasting helped confirm that the wines from the Petaluma Gap are indeed distinctive, and the foggy, windswept vineyards of the region are deserving of their own AVA. For those looking to learn more about the wines of the Petaluma Gap, mark your calendars for next year’s Wind to Wine Festival. Adobe Road is owned by professional racecar driver Kevin Buckler and his wife, Debra. He makes a variety of wines at his facility in Petaluma, ranging from Napa Valley and Knights Valley Cabernet, Dry Creek Zinfandel, Chardonnay, Viognier, Sémillon, and Grenache. Their lone wine of the Petaluma Gap tastings was the 2015 Sangiacomo Roberts Road Vineyard Pinot Noir. No new oak was used in the aging of this wine. With fairly bright red fruit and earth aromas, good acidity, and medium body, it was pleasant but not one of the day’s standouts. Agnitió, formed by the Belli and Cybulski families, is a label of Atlas Wine, along with Oro Bello and Omen. The team from Atlas Vineyard Management – which largely took over management of the old Premier Pacific Vineyards properties – farms highly-regarded vineyards such as Gap’s Crown, Sun Chase, and Durell. Alex Remy is the winemaker for Agnitió, and he poured me three wines at the tasting – 2013 Sun Chase Vineyard Chardonnay, 2013 Sun Chase Vineyard Pinot Noir, and 2014 Sun Chase Vineyard Pinot Noir. The Chardonnay was a standout – barrel-fermented with 25% new French oak and just 25% malolactic fermentation, it displayed bright lemon zest aromas plus stony mineral notes and a touch of flowers, with medium-light body and zippy acidity. The 2013 Pinot Noir was on the bigger side, with ripe plummy fruit, spice, and vanilla/oak, with a fairly rich mouthfeel and moderate tannins. I preferred the 2014 Pinot, showing floral and tea leaf aromas along with black cherry, earth, and mineral components, a lively mouthfeel, and fine tannins, quite nice. This was my first experience with Agnitió and the wines showed very well. The winery was founded by Duncan Arnot Meyers and Nathan Roberts in 2002. They’re highly-regarded for their Chardonnay, Pinot Noir, Cabernet Sauvignon, and Syrah, and they’ve also become known in recent years for wines from lesser-known California grapes. Duncan was on hand to pour his wines, and I tasted three of them at the event – 2014 Sonoma Coast Syrah, 2014 Clary Ranch Syrah (tasted at the seminar), and 2013 Griffin’s Lair Vineyard Syrah. The Sonoma Coast Syrah includes fruit from Clary Ranch and Griffin’s Lair vineyards in the Petaluma Gap, plus some from Que Syrah, Baker Lane, and Solas. Everything was picked and fermented separately, entirely with whole clusters, and a little with carbonic maceration – this was quite bright with lots of upfront red and black fruit, with great acidity and fine tannins. 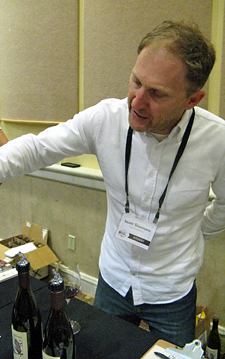 The Clary Ranch Syrah was one of my favorites at the morning seminar, featuring dark berry fruit, spice, flowers, iron, and herb/stem notes, bright and slightly lean texture, and chewy tannins – great aromatics now but could use time to smooth out. The Griffin’s Lair Syrah was another standout, with iron, smoke, herbs, and a touch of gamey funk on the nose, a richer mouthfeel and a big, grippy tannic finish – another wine with great promise but in need of cellaring. Arnot-Roberts presented one of the day’s strongest wine line-ups. 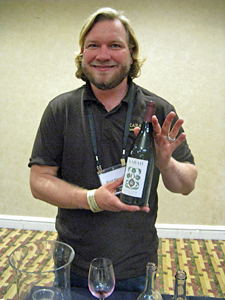 Bedrock’s Morgan Twain-Peterson is the son of Ravenswood winery founder Joel Peterson, and he launched the label in 2007. Chris Cottrell joined Morgan as a partner in Bedrock in 2012. I tasted the 2014 Griffin’s Lair Vineyard Syrah at the Griffin’s Lair table at the tasting, where vineyard owner Joan Griffin was pouring wines. The Syrah showed a bit of upfront funk, along with ripe and forward plum and darker berry fruit, a moderately rich mouthfeel, and medium tannins. Perhaps this young wine needs more time, but it was not one of the more notable Griffin’s Lair Syrahs at the tasting. Rebecca and Tom Birdsall are the proprietors of Black Kite. Rebecca’s parents planted their 12-acre estate Kite’s Rest vineyard in 1999 in the “deep end” of Anderson Valley, and the winery’s first vintage came in 2003. While they’ve been noted for their Anderson Valley wines for years, they began working with other sites in 2010, and they’re now developing a second estate vineyard near the small West Sonoma County town of Freestone. Jeff Gaffner has been the consulting winemaker since 2005. Rebecca and Tom were on hand to pour two of their wines – 2014 Gap’s Crown Vineyard Chardonnay and 2013 Gap’s Crown Vineyard Pinot Noir. 2013 was the first year that Black Kite worked with Gap’s Crown fruit. From Dijon clones, the Chardonnay was aged in 40% new French oak, and featured stone fruit and tropical fruit aromas, touches of vanilla and lemonpeel, and balanced a fairly creamy texture with fine acidity, quite nice. The Pinot is entirely from 777 clone, showing floral red fruits, earth, and savory herb notes with a moderately rich but lively texture. Both of Black Kite’s wines were very good. Brooks Note is a fairly new winery, founded in 2011 by Garry Brooks and his wife Joanne. Garry has worked for Ravenswood, Acacia, Kosta Browne, and Dutton-Goldfield, which is where he was introduced to Marin County vineyard sources. The focus so far has been on Chardonnay, Pinot Noir, and Pinot Rosé. Garry poured me two wines – 2013 Marin County Pinot Noir and 2014 Marin County Pinot Noir. Marin fruit sources have been Azaya and Chileno Valley vineyards, with percentages changing a bit from year to year, and the wines are typically made with around 10% whole-cluster fermentation and 30% new French oak. The 2013 Pinot, made from 2A and 777 clones at Azaya and 828 clone at Chileno Valley, showed very well, with rhubarb and strawberry, earth, tea leaf, and spice on the nose, a lively mouthfeel, and refined tannins. The 2014, sourced entirely from Chileno Valley in that vintage, had bolder and riper black cherry fruit, herbs, and a touch of vanilla/oak, with more structure and very bright acidity on the finish – this has potential but could use more bottle age to round out. Vintner Rick Davis has made wine for a number of well-known producers including Flowers, Londer, and Halleck – Calstar is his own label, launched in 2001. In addition to Pinot Noir, Calstar makes Chardonnay, Sauvignon Blanc, and Zinfandel. Rick was on hand to pour two of his wines – 2010 “Cuvée Ann” Chardonnay and 2012 Sangiacomo Roberts Road Vineyard Pinot Noir. The Chardonnay fruit was sourced from 50% each Sangiacomo Roberts Road and Ritchie vineyards. This featured bright apple and pear fruit, earth, spice, and a touch of vanilla, medium-light weight on the palate with a creamy yet lively texture and long finish. The Pinot, from about 67% 115 clone and 33% Swan clone, had mildly floral aromas along with spice, herbs, black cherry, and earth – somewhat reserved in character, and perhaps needing more time in the cellar and/or more aeration to show its best. The Clouds Rest estate vineyard was established in 1999 by winery owner John Saemann and general manager Scott Schuette, with the first vintage coming in 2002. The small vineyard features high-density planting in volcanic soil, and is located at 1,300-foot elevation on the west side of Sonoma Mountain. 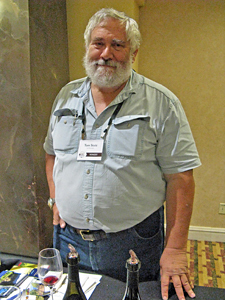 Veteran vintner Tony Austin makes the wines, which tend to get more bottle age prior to release than at many wineries. I tasted three Clouds Rest wines – 2012 “Allure” Chardonnay, 2012 “Femme Fatale” Pinot Noir, and 2008 “Limited Release” Estate Pinot Noir. The Chardonnay was my favorite of the three wines – showing pear and apple fruit, stony minerals, and zippy acidity along with a moderately rich texture and long finish. 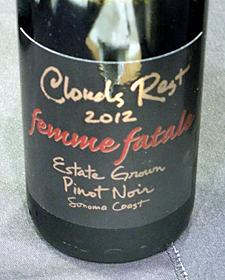 The “Femme Fatale” Pinot had a reddish tinge to the color, with rhubarb and cherry notes plus touches of spice and oak. A bit angular and acidic, this may benefit from more time in the cellar. 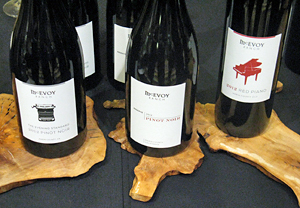 The “Limited Release” Pinot – bottled in 2010 – displayed less fruit with more tea leaf and forest floor scents plus a noticeably smoky element (perhaps from the 2008 wildfires?) and a richer mouthfeel than the “Femme Fatale”. 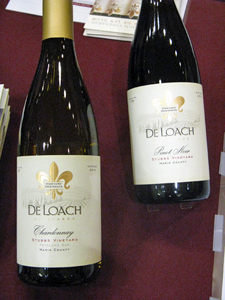 DeLoach, owned by the Boisset family since 2003, has long been known for its Sonoma County wines, particularly those from Russian River Valley. Starting with the 2009 vintage, the winery branched out into fruit sourced from northern Marin County fruit. Brian Maloney is the DeLoach winemaker, but noted vintner Dan Goldfield has worked with the winery on their bottlings sourced from Marin due to his long experience there. I tasted two wines at the DeLoach table – 2014 Stubbs Vineyard Chardonnay and 2013 Stubbs Vineyard Pinot Noir. Stubbs is one of the coldest vineyard sites in Marin, and this Chardonnay displayed bright pear and apple fruit plus a touch of vanilla/oak on the nose, with a fairly rich yet lively mouthfeel and a clean finish, nice. The Pinot Noir had strawberry fruit in the background, with earth, mushroom, and tea leaf upfront, medium body and moderate tannins – some bottle age may be of benefit to this wine. Proprietor Cecilia Enriquez’ family acquired their estate vineyard near Old Adobe Road east of Petaluma in 2011, while the winery’s first releases came from the 2009 vintage. 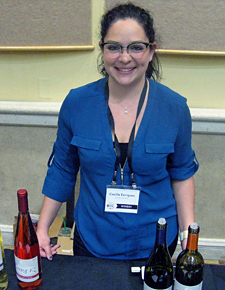 Cecilia poured me four wines at the tasting – 2012 “Brisa,” 2014 Tempranillo Rosé, 2011 Pinot Noir, and 2011 Tempranillo. The “Brisa” is a co-fermented field blend, predominantly Sauvignon Blanc with a little Chardonnay and small percentage of Muscat. Lightly floral with stone fruit and herb notes and medium weight on the palate, it showed just enough of Muscat’s distinctive character to add interest but not enough to overpower the wine. Tempranillo is not a variety you’d expect to see in the cool Petaluma Gap region, and the Rosé – made by direct press and aged in stainless steel – this had somewhat shy but bright red fruit and spice on the nose, refreshing acidity, with a slight bitter note on the finish. I wasn’t a fan of the Pinot, which despite some nice floral and red fruit aromas also had an odd, resiny component, perhaps from the cooperage used. The Tempranillo was better, aged 16 months in American oak, with black cherry and plum fruit, spice, and earth, medium-bodied with good structure and moderate tannins on the finish. Fogline Vineyards was established in 2009 by friends Evan Pontoriero and Brent Bessire. Their estate vineyard is near the northern edge of the Petaluma Gap region at about 900-foot elevation on Sonoma Mountain. Initial plantings began in 2007 and have continued over the years – it’s planted mainly to Pinot Noir along with some Chardonnay and a little Sauvignon Blanc. I tasted four wines at the Fogline table – 2014 Zephyr’s Block Estate Chardonnay, 2014 “Bacchus” Pinot Noir, 2013 “Fogline Neighbors” Pinot Noir, and 2013 Hillside Block Estate Pinot Noir. The Chardonnay was one of the day’s best, with bright lemon, baked apple, spice, and a light touch of vanilla/oak, with medium body, fine acidity, and a long, lively finish. The “Bacchus” Pinot includes fruit from nearby Janian Vineyard along with some from the Estate Hillside Block and was fermented with 50% whole clusters. This showed bright, minerally red fruit aromas along with tea leaf and earthy forest floor notes, with medium weight and milder tannins – should be very nice for drinking in the near term though it has the potential for aging too. The “Fogline Neighbors” Pinot was sourced from three vineyards and made with 30% whole clusters – this had an earthier profile with smoky undertones along with black cherry and plum fruit, and a firmer tannic finish. The Hillside Block Estate Pinot had more forward red fruit aromas, with notes of mushrooms, earth, and herbs in support, plus great acidity and fine tannins – this should develop nicely with time in the cellar. 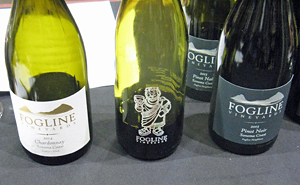 The Fogline wine line-up was one of the strongest of the tasting. 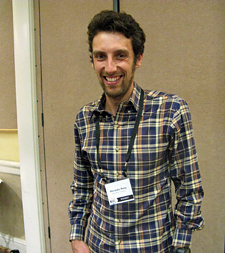 Originally from Chile, Alex Guarachi has been a longtime wine importer, and launched his own label in 2007. He teams up with winemaker Julian Gonzalez, who had previously worked with Paul Hobbs. Sun Chase Vineyard, at 1,400-foot elevation on the flanks of Sonoma Mountain near Gap’s Crown, is one of Guarachi’s estate vineyards. I tasted four Guarachi wines – 2014 Sun Chase Vineyard Pinot Noir, 2014 Sonoma Coast Pinot Noir, 2014 Gap’s Crown Pinot Noir, and 2013 Sun Chase Vineyard Chardonnay. The 2014 Sun Chase Pinot was a standout, displaying earthy and stony mineral aromas upfront, followed by black cherry fruit, herbs, and a touch of vanilla/oak, with medium body and a bright, lively texture and finish. The 2014 Sonoma Coast bottling, which includes fruit from Sun Chase and Gap’s Crown vineyards, had more forward black cherry and plum fruit along with spice and tea leaf notes. The 2014 Gap’s Crown had a distinctly plummy fruit profile along with earth and sweet oak on the nose, plus a richer mouthfeel and firmer tannins on the finish. I finished up with the Chardonnay – barrel-fermented but only 10% went through malolactic fermentation – which was another highlight, with pear, lemonpeel, and earth scents, bright texture, and crisp finish. I had not tasted the Guarachi wines before, but they showed very well. Michael Karah purchased property in 1995 in the Cotati area and began planting it a few years later. The 40-acre vineyard is mostly Pinot Noir along with Chardonnay added in 2000. The first estate wines were produced in 2001. Assistant winemaker Reid Kinnett was on hand to pour the Karah wines, and I tried four of them – 2011 Estate Pinot Noir, 2013 Estate Pinot Noir, 2015 Estate Pinot Noir (barrel sample), and 2016 Estate Pinot Noir (barrel sample). The 2011 displayed earthy black cherry fruit along with lots of earth and tea leaf notes, medium weight with moderate structure. I preferred the 2013, with brighter and slightly tart red fruit, herbs, forest floor, and a touch of funk (in a good way), a bit more structure, and fine tannins on the finish. It was a bit tough to judge the two barrel samples, though the 2015 – to be bottled in March – featured a darker fruit profile and great acidity, while the 2016 had lots of bright and upfront fruit. Arturo Keller and Deborah Keller established their estate La Cruz Vineyard in 1989, and they launched their wine label in 2000. Arturo’s daughter Ana is a key member of the Keller team, along with winemaker Alex Holman. Their beautiful gravity-flow winery was designed by famed Mexican architects Ricardo and Victor Legorreta. I tasted four Keller wines – 2015 Rosé of Syrah, 2013 La Cruz Vineyard Chardonnay, 2012 La Cruz Vineyard Pinot Noir, and 2013 “Rôtie” Syrah (tasted at the seminar). The Rosé was kept on the skins for 12 hours and cold-fermented – it displayed a richer texture for a rosé, along with watermelon and herb scents. The Chardonnay was fermented in 30% new French oak, and had a rich, buttery, and creamy character. The “Rôtie” Syrah combined aromas of both red and black fruits plus earth and oak notes, with a bright texture and moderate tannins. My favorite of the Keller wines was the very good Pinot Noir, featuring black cherry, tea leaf, spice, and a touch of sweet oak on the nose, with a lighter texture and bright acidity. Stewart Johnson’s estate vineyard, on the northern edge of Marin, is planted mostly to seven clones of Pinot Noir with a little Viognier added in 2011. Stewart makes his wines on Treasure Island in San Francisco Bay. (Disclosure – I’ve helped bottle some of the Kendric wines) Stewart poured three wines at the Kendric table – 2014 Marin County Viognier, 2013 Marin County Pinot Noir, and 2012 “Reserve” Marin County Pinot Noir. The Viognier showed bright and slightly tart tropical fruit aromas with slight floral undertones, with good acidity on the palate. The 2013 Pinot had bright red fruit, rhubarb, tea leaf, and a touch of spice, with medium weight and a lively texture and finish, quite nice. The 2012 “Reserve” Pinot had black cherry fruit more in the background, plus earth, dried herb, spice, and vanilla/oak components, a richer mouthfeel, and more tannic finish – has potential but still needs more bottle age to show its best. Pinot specialist La Rochelle was founded in 2003 by the Mirassou family and purchased by Steven Kent Mirassou in 2005. His ancestor, Pierre Pellier, is often credited with bringing the first Pinot Noir vines to California in the 1850s. Steven sold the label to his friend Chuck Easley a few years ago, and winemaker Tom Stutz has stayed on. Tom was on hand for the tasting and he poured me two wines – 2014 Parliament Hill Vineyard Pinot Meunier and 2012 “Experience” El Coro Vineyard Pinot Noir. The Pinot Meunier was bright, with higher tones of strawberry and cranberry plus earth and herb notes and moderate structure and tannin – seems like this will be an early drinker. The Pinot, sourced from the Keller estate property, showed darker fruit with more of an earthy and somewhat funky element, with a firmer tannic structure and finish. Loxton ownerand winemaker Chris Loxton is originally from Australia, and founded his winery in 2000. He focuses mainly on Syrah, along with small lots of Zinfandel, Pinot Noir, Chardonnay, Cabernet Sauvignon, and a few other wines. I tasted the 2013 Griffin’s Lair Vineyard Syrah at the Griffin’s Lair table at the tasting, where vineyard owner Joan Griffin was pouring wines. 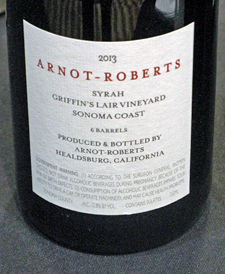 Bottled under a screwcap closure, I thought this wine displayed fairly shy but pleasant aromatics, with dark fruits, herbs, and a floral note, with a bright, clean mouthfeel and milder tannins than other Griffin’s Lair Syrahs at the event. Showed promise and perhaps just needed more aeration to really open up. Grower/winemaker James MacPhail launched his winery in 2002. The focus is mainly on Pinot Noir, along with some Chardonnay, and fruit sources include the Sonoma Coast, Anderson Valley and a few other regions. MacPhail’s new energy-efficient production facility is located just outside Healdsburg. I tasted three wines at the MacPhail table – 2013 Gap’s Crown Chardonnay, 2012 Gap’s Crown Pinot Noir, and 2013 Sangiacomo Vineyard Pinot Noir. From Dijon 76 clone, the Chardonnay had ripe stone fruit and tropical fruit aromas along with butter and vanilla overtones, a creamy texture, and smooth finish – one of the bigger Chardonnays at this tasting. The 2012 Gap’s Crown Pinot featured ripe black cherry, earth, and spice on the nose, with a rich mouthfeel and firm tannins. I preferred the 2013 Sangiacomo Pinot, which showed more of an earthy, savory character along with black cherry and sweet oak notes, good structure, and moderately tannic finish. Long-known for their fine olive oil, McEvoy Ranch planted about 8½ acres of their land with grapevines in 2006, starting with Pinot Noir, Syrah, Montepulciano, Grenache, Viognier, Alicante Bouschet, and Refosco. Since 2012, McEvoy Ranch has also taken over farming 19 acres of vines at Azaya Ranch. The wines are made at their home ranch, and Blake Yarger heads up the winemaking team. Blake was on hand at the tasting, and he poured me three wines – 2012 “The Evening Standard” Estate Pinot Noir, 2013 “Reserve” Estate Pinot Noir, and 2012 Estate “Red Piano.” The 2012 Pinot is a 50/50 blend from each of the two estate vineyards, and was quite nice, displaying bright red fruit, earth, forest floor, and mild floral notes, with medium weight and lively acidity. The 2013 “Reserve” Pinot, from Mariafeld (23) and 115 clones at the McEvoy Ranch site, stepped up the intensity of the 2012, especially with the forest floor and floral notes, showing more structure with fine tannins on the finish – this promises to develop nicely with more bottle age. The “Red Piano” is a field blend of the varieties at the home ranch – the 2012 included Syrah, Grenache, Alicante Bouschet, Montepulciano, Refosco, plus a little Viognier. This had some funky, leathery aromas along with darker berry fruit, spice, and moderate tannins. Pax and Pam Mahle’s re-launched the Pax Mahle label in 2014, joining their Wind Gap and Agharta projects. Pax had started his first label in 2000 after working as a wine buyer for Dean & DeLuca. The new Pax Mahle releases have been mostly Syrah and Grenache sourced from Alder Springs, Castelli-Knight Ranch, and Griffin’s Lair vineyards in Sonoma and Mendocino County. I tasted one Pax Mahle wine – 2013 Griffin’s Lair Vineyard Syrah (tasted at the seminar). Fermented with whole clusters and aged in neutral oak, this was my favorite Syrah of the morning seminar. Blackberry fruit along with savory herbal notes, with undertones of iron, game, and a touch of black pepper, structured mouthfeel with fine acidity and grippy tannins on the finish. It’s impressive now but still very much a youngster, and it deserves time in the cellar to develop further. Pellet is best-known for its Napa Valley wines sourced from their estate vineyard near St. Helena, but they also make Chardonnay from Sun Chase Vineyard, developed in 2007 on the western slope on Sonoma Mountain. Greg and Robin Krill are the Pellet proprietors, and Tom Rinaldi, a veteran of Duckhorn among other producers, is the winemaker. Eric Risch, the general manager and director of winemaking at Pellet, poured me three wines – 2014 “Un-Oaked” Estate Chardonnay, 2014 Estate Chardonnay, and 2012 Estate Napa Valley Cabernet Sauvignon. The “Un-Oaked” Chardonnay was made entirely in stainless steel, using lees-stirring to help build texture. This displayed bright citrus and pear aromas along with notes of flowers and herbs, with medium body and a crisp finish. The second Chardonnay was barrel-fermented in 30% new French oak and showed tropical fruit and spice on the nose, balancing good acidity with a rich, creamy texture. Eric offered me a taste of a non-Petaluma Gap wine as well, their Estate Napa Valley Cabernet (about 90% Cabernet Sauvignon, 8% Merlot, and 2% Petit Verdot), aged in 75% new oak. Bold, upfront dark fruit and vanilla/oak aromas, this had a big, rich mouthfeel but fine structure with refined tannins. Kimberly Pfendler is the proprietor of the Pfendler label, established in 2007. Peter Pfendler planted his family’s first vineyard on the slopes of Sonoma Mountain in 1992, and three more estate vineyards have followed. Well-known vintner Greg Bjornstad is the Pfendler winemaker. I tasted two wines at their table – 2015 Rosé of Pinot Noir and 2014 Sonoma Coast Chardonnay. The Rosé was made by 50% each direct press and saignée, then fermented and aged in neutral French oak. This was very nice, with bright strawberry fruit along with touches of earth, flowers, and spice, a lively mouthfeel and refreshing finish. The Chardonnay was fermented in 40% new French oak, and showed ripe apple and pear aromas along with notes of spice and vanilla/oak, with a creamy, rich texture and long finish. David Ramey and his wife Carla founded the winery in 1996, and David heads up the winemaking team along with Cameron Frey. The winery has focused on Chardonnay, Pinot Noir, and Syrah from cooler-climate vineyard sites along with Napa Valley Cabernet Sauvignon. 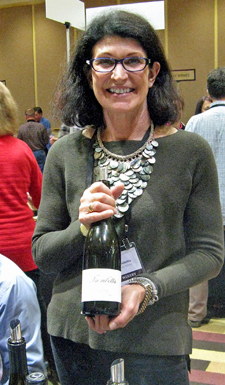 I tasted one Ramey wine at the event – 2013 Rodgers Creek Vineyard Syrah (tasted at the seminar). Aged for 24 months in 100% new French oak, it was not surprising that the wine showed more vanilla and spice oak aromas than the others at the seminar. It also displayed plenty of upfront dark berry fruit, herbal notes, but not much floral character that you might expect given the 10% Viognier co-fermentation, and a moderately rich mouthfeel with a firm tannic finish. A polished wine, but not as expressive as many Rodgers Creek Syrahs I’ve tried. Rodney Strong established Sonoma County’s 13th bonded winery in 1959, and over the years they’ve become of Sonoma’s best-known producers. He built the distinctive winery facility near Healdsburg in 1970. Tom Klein is the current proprietor, and Rick Sayre heads up the winemaking team along with Justin Seidenfeld and Greg Morthole, with David Ramey as consulting winemaker. I tasted two wines at the Rodney Strong table – 2014 Sonoma Coast Chardonnay, and 2013 Sonoma Coast Pinot Noir. The Chardonnay fruit was sourced from Blue Wing Vineyard, close to San Pablo Bay in the southeastern part of the Petaluma Gap. This displayed bright green apple and lemon aromas along with a creamy texture and zippy acidity, nice. The Pinot had cherry, herb, and smoke on the nose, with medium weight and a fairly smooth texture. 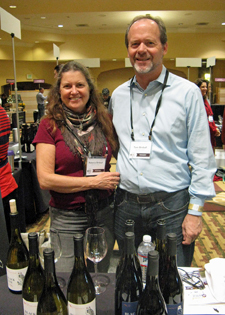 Sojourn was founded in 2001 by Craig and Ellen Haserot and winemaker Erich Bradley. Located in Sonoma, the label specializes in Chardonnay and Pinot Noir from the Sonoma Coast and Russian River Valley, and Cabernet Sauvignon from Napa Valley. I tasted three current Sojourn wines – 2014 Sangiacomo Vineyard Pinot Noir, 2014 Rodgers Creek Vineyard Pinot Noir, and 2014 Gap’s Crown Vineyard Pinot Noir. My favorite of these three Pinots was the first one I tried, from Sangiacomo Vineyard. This featured the earth and mushroom aromas that wines from this vineyard often display, plus black cherry and a undertones of sweet oak, with a moderately rich mouthfeel and lively finish, nice. The Rodgers Creek Pinot was fermented with about 15% whole clusters, and showed earth, lots of dried herbs, and red fruit on the nose, medium-bodied with firm tannins. The Gap’s Crown Pinot used about 10% whole-cluster fermentation, and had bolder, riper black cherry and plum fruit, spice, and vanilla/oak aromas, with a bigger structure and tannic finish – this will need time to smooth out. Three distinctive Pinots that showed their vineyard sources well. Bill and Caryn Reading are the proprietors of Sonoma Portworks, located right in Petaluma, and Bill is the winemaker. Launched in the mid-1990s, this is the only winery in Sonoma County that specializes in sweet wines. The grapes for the Port-style wines I tried actually all came from Heringer Estates in Clarksburg. I stopped at this table at the very end of the tasting, and tried three Sonoma Portworks wines – 2013 “Aris” Petit Verdot Port, 2011 “Aris” Petite Sirah Port, and NV “Maduro Reserve” Tawny Port. The Petit Verdot Port spent two years in barrel, and showed nutty dark fruit aromas, with medium body and moderate sweetness. The Petite Sirah Port had a richer character, with more chocolate overtones along with dark berry notes. The Tawny Port was my favorite of the three – entirely from Petite Sirah and mostly from the 2005 vintage, this batch was bottled in September 2016. It displayed lots of caramel, spice, honey, and nut aromas, a rich texture and slightly sweeter finish – my final wine of the day and a good way to conclude the Grand Tasting. Proprietor Rickey Trombetta Stancliff and her husband Roger established the Trombetta label, with the first wine coming from the 2010 vintage. Their daughter Erica is the winemaker, while Paul Hobbs is the consulting winemaker. To date, all of the Trombetta vineyard-designated wines have come from Gap’s Crown Vineyard fruit. Rickey poured me four wines at her table – 2015 Gap’s Crown Vineyard Chardonnay, 2012 Gap’s Crown Vineyard Pinot Noir, 2013 Gap’s Crown Vineyard Pinot Noir, and 2014 Gap’s Crown Vineyard Pinot Noir. The Chardonnay is Trombetta’s first, and it was very good, with bright, ripe stone fruit and tropical fruit aromas, touches of spice and vanilla/oak, a creamy yet lively mouthfeel and long finish. The Pinots were all aged in 50% new French oak. The 2012 Pinot displayed ripe black cherry and earth on the nose, along with spice and sweet oak notes, fairly rich mouthfeel and firm tannins. The 2013 vintage was similar, with a darker fruit profile, bigger spice component, and smooth texture. The 2014 Pinot was my favorite of the three, featuring brighter acidity along with its black cherry, tea leaf, earth, and oak notes, livelier mouthfeel and fine tannins. Trombetta poured a good group of wines. Waxwing owner/winemaker Scott Sisemore launched his label in 2007, after a number of years working with well-known producers including Ravenswood, Rosenblum, and Pellegrini. Scott’s focus is on cooler-climate Riesling, Pinot Noir, and Syrah, and he makes his wines in Belmont, on the San Francisco Peninsula. (Disclosure – I’ve helped bottle some of the Waxwing wines) Scott poured three wines at the tasting – 2013 Spring Hill Pinot Noir, 2014 Spring Hill Pinot Noir, and 2013 Flocchini Vineyard Syrah (tasted at the seminar). I preferred the 2013 vintage of the Pinot, with earth, mushroom, and tea leaf aromas plus red fruits and a touch of spice, with medium body and a lively finish. The 2014 Pinot showed more forward and somewhat more tart red fruit with a stony mineral note – it has potential but needs more time to integrate its components. The Syrah was one of my favorites at the seminar, with herbs, black pepper, and touches of spice, flowers, and black olives on the nose, lively and structured with chalky tannins on the finish – nice now but should develop well with more time in the cellar. A very good showing for this up-and-coming producer.